The narrative of this then & now post will be familiar to regular readers. This mid 1960s photo shows a row of brick cottages that comprised 151, 153 & 155 Warwick Road, photographed by John Drew in 1964 for his book Kenilworth – A Manor of The King (Pleasaunce Press, 1971) shortly before its demolition. 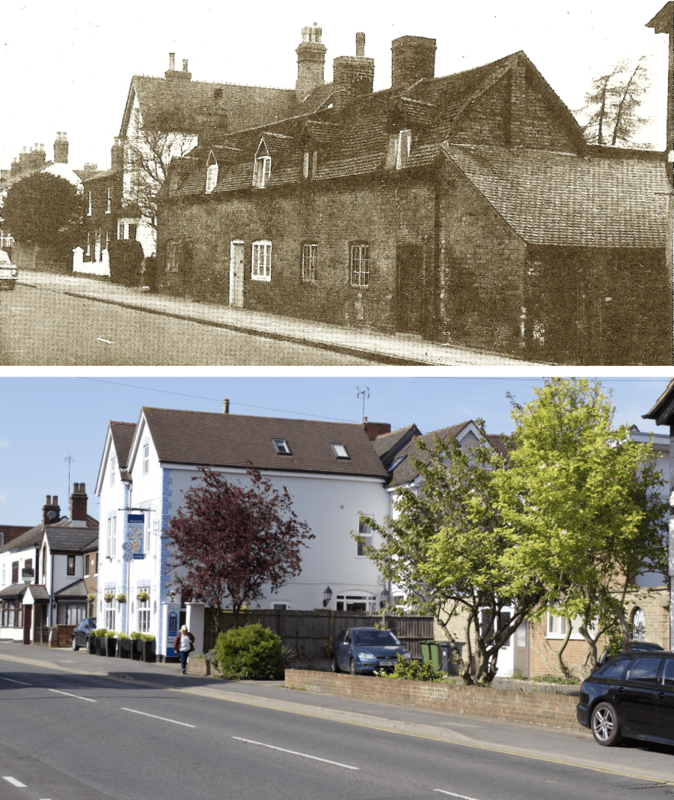 The age of the lost buildings is not recorded, but they appear not dissimilar to the row of Grade II listed cottages at 59-63, Warwick Road currently occupied by The Kenilworth cocktail bar, which are described as “Late C18 – early C19 but partly with c1700 core”. John Drew wrote the above book, covering the history of Kenilworth since Saxon times, at a time of rampant demolition in the name of modernisation. A chapter is devoted to the wholesale changes of the 20th century. Given the scale of the demolition, the closing chapter of the book concludes in an understandably gloomy fashion: “Like many other places, Kenilworth is becoming a vast dormitory where people sleep between spending their working hours in Coventry, Leamington or Birmingham. This all adds up to the terrifying destruction of what was a beautiful old English town. It is not too late to preserve what little is left, whether it is a pleasant footpath across the local fields or some architectural gem, but the time is now very short. Does anyone care? Let us hope so”. Unlike many such demolitions of residential properties along Warwick Road in the 1960s, this one did not result in the construction of a commercial unit. The plot is today occupied by a 1960s house with a distinctive gull-wing roof. The rear gardens of the old properties, which once extended as far as the railway line, have been truncated by the building of the houses on Clarke’s Avenue. In the background of the ‘then’ photo is a single white gable end, belonging to a former doctor’s surgery which has since been extended. Today a second gable end has been added, in a style sympathetic to the original, and the frontage of both extended towards the road. The chimneys survive in a truncated form, as do the rear wings of the property,which today is occupied by The Coconut Lagoon restaurant.